Sunday: Mother's Day Barbecue: Burgers, Shrimp, Grandma's German potato salad, green salad with olives, red peppers, avocado, and Grandma's pound cake with blueberry sauce. Saturday: Company's coming. Lets go out! I'm resting today, exhausted. It was an extremely hectic weekend since on Saturday I planted most of our garden and on Sunday, hosted a barbecue for mother's day. That means everything I normally do on the weekend was multiplied and magnified a hundred times, since I had to intensively clean the house, get ready for guests, and complete a huge gardening project in addition to the hundred other things that usually get done. Yes, every muscle in my body felt it and it would not surprise me if I lost five pounds in sweat alone. Still, it was worth it. Our mothers had a good time, and my 87-year old grandmother enjoyed sharing her famous potato salad and pound cake. Not to mention, dispensing gardening advice where needed (she could grow an oak tree out of a rock if she had to). Oh, and it was the first time using our new barbecue, which I now feel much more confident about using since we successfully grilled some burgers and shrimp. Much more grilling to come this year. In the Garden: It's all in: Sweet bi color corn, jalapeno peppers, Serrano peppers, California wonder sweet bells, five kinds of tomatoes, mustard greens, spaghetti squash, gherkin cucumbers, dill and cilantro (the only herbs I direct sow) in addition to our lettuce, high-yield peas, and berries. 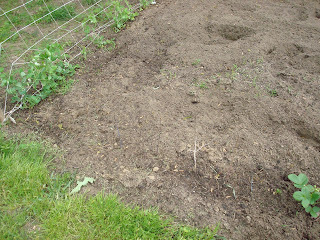 This year I though for certain that I would not plant nearly as much as last year, but somehow I flunked that test. Look closely, can you see them? Little sticks sticking out of the ground. Trees! This is what happens when you marry a part-time tree farmer and saw mill guy: He finds a semi-permanent location in your garden and uses it to make starters for his forest. Now, wouldn't it be nice if it rained right now? We will be having company in two Sundays. She's kind of laid back, so I'll make sure the floors are swept. YUM - Do you deliver?? Problem - when I click on the turkey crescents, it takes me to the Penne alla Norma. When I click on the Penne alla Norma, it takes me to the Penne alla Norma. Do the turkey crescents and the pasta dish really look that much alike?? HA HA Seriously though, I need the turkey recipe - it sounds way too good!! Yikes- sorry Beth! Link should be fixed now. Great menu and I hope your Mothers Day went well except being tired. So u got to try out your new bbq? nice. 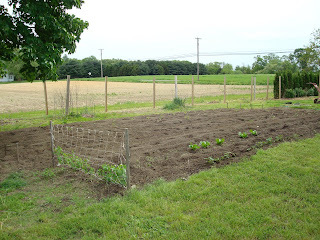 Your garden looks great happy planting. I'm off to get a few of your recipes. Monica I forgot to ask u about? recipes for? Looking for recipe in famous potato salad and pound cake. Sorry Brenda, I just don't have those recipes. They're in my grandmother's head! My mother has a written down copy of the pound cake recipe, but says she tried making it several times and it never comes out right. Hi there!! Just caught your comment on HSB. Noah is feeling great today. Now comes the training again....no whining to get yoru way as you did when you were sick and could barely talk. UGH! Your mother's day meal with the mothers and grandma sound wonderful!!!! YUMMO on the menu planner as well. It was a little bitter sweet here on Mother's Day. Missing my mom (both of my grandma's are gone too), but having a wonderful little family and a wonderful 3 year old to fill my day with! Have a wonderful week hun!